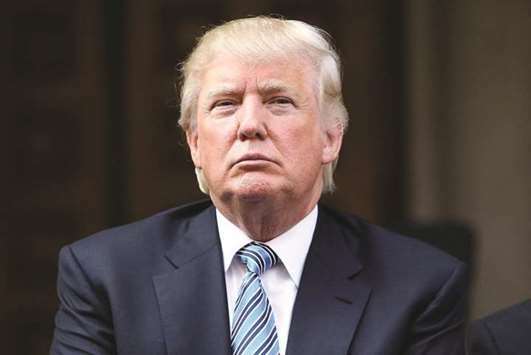 US President Donald Trump may travel to the heavily fortified demilitarised zone (DMZ) separating North and South Korea when he visits South Korea next month, the South’s Yonhap news agency said yesterday, citing a defence source. The White House sent an advance team of working-level officials in late September to check candidate sites for Trump’s “special activity” in South Korea, the source was quoted as saying. Trump was expected to send a significant message to North Korea, either verbally or “kinetically”, during his first trip to the peninsula as US commander-in-chief, the source said. The truce village of Panmunjom and the observation post, both inside the DMZ, were among locations Trump was considering visiting, the source said. Yonhap did not elaborate and the White House did not comment. Trump and North Korean leader Kim Jong-un have been engaged in an increasingly bellicose exchange of rhetoric, with Trump suggesting the military option was the only way to halt the North’s missile and nuclear programmes. A trip to the DMZ, following in the footsteps of his predecessor, Barack Obama, and Vice President Mike Pence, would bring Trump within yards of North Korean soldiers, who stand eyeball to eyeball with their South Korean enemies, and likely be regarded by the North as highly provocative. In recent weeks, North Korea has launched two missiles over Japan and conducted its sixth nuclear test, all in defiance of UN Security Council resolutions, and may be fast advancing toward its well-publicised goal of developing a nuclear-tipped missile capable of hitting the US mainland. Trump repeatedly has made clear his distaste for dialogue with North Korea. Last week, he dismissed the idea of talks as a waste of time, a day after Secretary of State Rex Tillerson said Washington was maintaining open lines of communication with Kim Jong-un’s government. “Our country has been unsuccessfully dealing with North Korea for 25 years, giving billions of dollars & getting nothing. Policy didn’t work!” the US president said in a Twitter post on Monday. Reclusive North Korea and the rich, democratic South are technically still at war because their 1950-53 conflict ended in a truce, not a peace treaty. The North regularly threatens to destroy the South and its main ally, the United States. Trump is scheduled to visit Japan, South Korea, China, Vietnam and the Philippines starting from November 3.